Remains or ‘Steve Nile’s Remains’ (as it’s often known elsewhere) is a post-apocalyptic zombie horror movie based off a comic book series of the same name. I had never even heard of the series beforehand so I had nothing to compare it too except other zombie movies. The premise of Remains is pretty good & sees a nuclear explosion occurring on world peace day devastating Reno in Las Vegas. From this catastrophe come the walking dead & a few survivors find themselves trapped inside a casino hotel fighting radiation sickness, a dwindling food supply & the army of zombies outside. The few survivors are a mixed bunch of characters, the kind of people you might expect to see around Las Vegas. Everyone has a story to tell…or at least you’d hope they would, sadly instead we end up with some serious one-dimensional characters with some average acting. Beyond the 2 lead characters there is little development for anyone & it leaves you in that ‘I don’t care who dies next’ situation. Mostly they just fodder for the hordes of zombies. 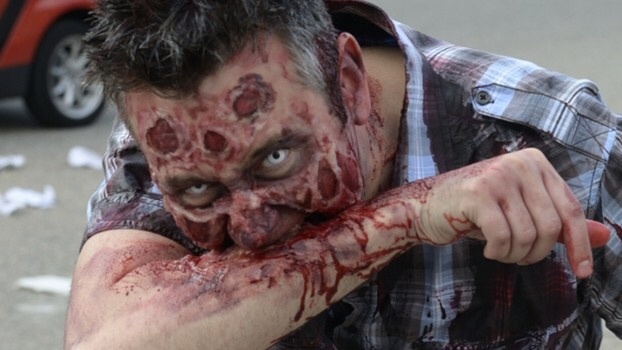 Top marks to the make-up artist for the zombies, they look really good & unique. 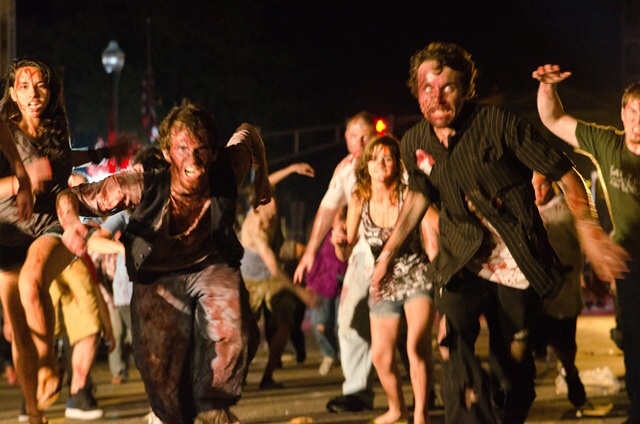 Remains choices of zombie are fast-paced creatures jumping from smart to unbelievably dumb. I’m a huge fan of creators making bold decisions with zombies these days. It’s the only way to keep things fresh (pun intended) but too often they just don’t work & Remains decision to have its zombies sleep at night is one that left me feeling a bit cold. That being said, there are some really good moments involving the zombies & the level of gore is just about right. It can sometimes seem a bit cartoonish & some of its CGI is really bad but it fits the movies style nicely & I do like the bright lights of Reno setting (it kind of reminded me of Dead Rising 2 especially later in the film when a giant hamster ball is used as a weapon). Like all zombie movies it has no choice but to up the ante for its finale which sees a roaming band of soldiers arrive supposedly to help but to actually scavenge for supplies before moving on. This inevitably leads to clash with the current survivors resulting in a blood-bath, a tacked on back story (that you won’t care about) & a sequel-bait ending. At 88 minutes long it’s short enough to enjoy but it raises far too many questions. Sit back & enjoy it for what it is? That would be fine if it was a good zombie movie but it isn’t. Average acting with some of unmemorable characters mixed with great zombie make-up, decent gore & a good story. Remains is a strange zombie film & one that maybe didn’t need its comic book adaptation.